Learn the basics of the tags page. Users are able to view all global tags on this page. Global tags are tags that are pre-populated into the offrs account. Users are also able to create custom tags from the tags page. Locate the 'Advanced' module on the left hand side. A Tag is a way to label a person so you can easily search for them or launch a campaign to them. Tags enable our automated marketing to work. When you "tag" a person, we then know what to do. From the tag page you will notice the following (left to right): Tag, Alias, Type, Class, Expires, Actions. Tag: This is the name of the tag created. You are able to edit the name of the tag if it is not a Global Tag. The Global Tags cannot be changed. Note: If you click on the Tag it will direct you to the leads with this particular tag applied. Alias: You cannot change the name of Global Tags, but you are able to give them an Alias instead. The Alias will always override the tags main name. An Alias tag works for both Custom and Global Tags. An example of when you would like to use an Alias would be for a territory. Instead of the eleven digits, you would refer to the territory by a name. Type: If you are wondering if the tag you are looking at is a Global or a Custom tag, it will be indicated under Type. Class: There are three different classes for tags. GEO: This particular class will only be applied to your territories. This is the tag that homeowners in that specific territory will get. Descriptive: Most of the tags will be descriptive tags. Just like the name suggests. Status: These tags help to organize leads in the lead nurturing process. Expires: You are able to set up tags to expire within a certain amount of days. You will not be able to modify global tags but you are able to edit custom tags. 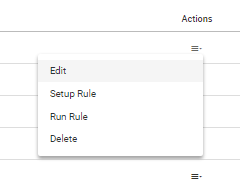 The 'Action' column will provide a drop-down menu (pictured above) that allows you to edit, set-up rule, run rule, or delete. Edit: You will be able to edit the rule name, give it an alternate name (alias), include in it shortcuts, or select how many days after the tag is applied that it will expire. Run Rule: Click on 'Run Rule' only after you have set up your rule to match your preference. After clicking, it will run immediately. Delete: Click this if you would like to delete your custom tag. Deleting your tag will delete this tag from all people with it applied. You can create your own custom tags by clicking on the 'Create a New Tag' button near the top right corner. Search Terms: Tagging, tags, tag, page, screen, dashboard, custom, global, alias, rule, set-up.